At Rawlins Paints, we stock a wide range of asphalt, concrete and metal repair products to deal with damage to floors, walls, pipes, driveways and other surfaces. We have everything from epoxy repair mortars, flexible fillers, self-levelling screeds, emergency pipe repair kits and road repair products to ceramic pipe repair products, for interior and exterior use. If you’re not sure which repair product you need, then get in touch with our Technical Team who will be happy to talk you through the different options. Blackfriar Concrete Repair Mortar is a two-pack, high performance, quick hardening epoxy concrete repair mortar for damaged and eroded concrete, masonry and brick surfaces within heavy traffic areas. Rust-Oleum 5190 Epoxy Repair Mortar Deep Fill is a very strong epoxy repair mortar for quick and economical repair of deep holes in concrete floors. Stronger than concrete! 202 Vertical Surface Repair Mortar is a fast setting epoxy repair mortar for vertical and overhead repairs providing a strong and durable, weatherproof repair for concrete, brickwork, stonework and steel substrates. Ideal for repairs to spalled or damaged concrete structures and cosmetic refurbishment of old stone and brickwork. 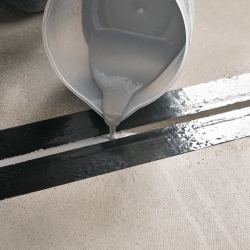 Rust-Oleum Speed Patch Pourable Grade is a quick setting, pourable repair mortar that is ideal for patch repairs for heavily trafficked floors. A pourable, flexibilised methacrylate sealant hard and tough enough to protect arris edges from heavy wheel loading, but possesses sufficient flexibility to accommodate a degree of movement. For asphalt patching you’ll need to have a look at our Rust-Oleum Asphalt Repair Starter Kit. Everything you need is in the kit for fast repairs of asphalt, tarmac and concrete surfaces. Speed is often of the essence when repairing driveways and tarmac roads, as it’s important to minimise disruption as far as possible. If you have potholes on your driveway, or need to repair a stretch of road, then this kit is perfect. It’s a bitumen-based kit ideal for paths and car parks as well as driveways and roads. As soon as you’ve filled in the pothole or repaired the damaged asphalt driveway, it’s can be driven on. 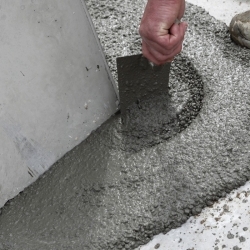 No mixing is needed and the end result can easily withstand heavy traffic. This kit can deal with repairs from 10mm to 70mm and is an effective driveway patch repair. 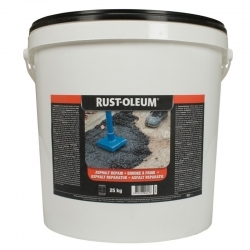 If you’d rather buy the products separately we also stock Rust-Oleum Asphalt Repair and a Rust-Oleum tamper. It’s the same durable bitumen-based patch repair material as in the kit, made up of a liquid binder and polished aggregate. This pack can be used to repair holes between 25 and 100mm in size, so it’s great if you have to repair larger asphalt damage to a road surface. Sika MonoTop 610 - a cementitious based steel reinforcement primer and bonding bridge. Also available is Sika MonoTop 620, here. Sikalastic 1K - a one component, flexible, fibre-reinforced mortar. Sikatop Seal 107 - a two part polymer modified cementitious waterproof mortar slurry. Sikascreed Hardtop - a high strength, rapid hardening, floor levelling mortar. Sikafloor Level 30 - a high performance, cementitious, self levelling and fast drying, cementitious screed. Sika Damp Proofing Slurry - a 1-component damp proofing and waterproofing mortar for the damp-proofing of underground buildings. Click here for more information and products from Sika. 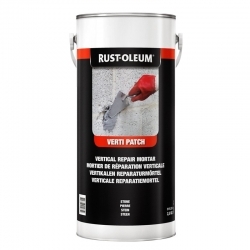 Rust-Oleum Verti-Patch is a unique repair product with special lightweight fillers, meaning it can repair damaged vertical render, concrete and stone. Perfect for kerb repair or wall repair, this epoxy repair mortar dries as hard as granite and can be used inside and outside. It’s easy to use and great for frost-spalled concrete surfaces that need to be reinforced. 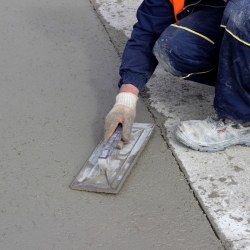 Very cold weather and temperatures can make concrete tricky to repair. Sometimes conventional repair mortars can’t fully dry or cure in low temperatures and something like Coo-Var CSP Mortar is needed. This is an epoxy-based repair mortar for concrete surfaces (either walls or floors) that need to be repaired before they can be painted or coated, or just need a stand-alone repair. For a really fast repair to concrete, troughs, ramps, coving and steps, Rust Oleum Speed Patch works well. 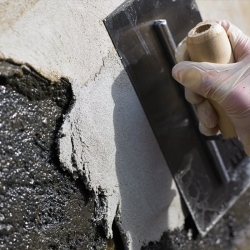 It sets fast and is a very high-strength concrete repair mortar, giving you the finish you want with the minimum of fuss and expense. 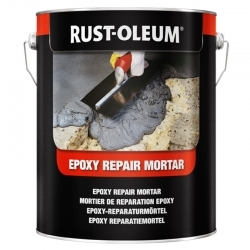 If you need a very strong floor repair, choose Rust-Oleum Epoxy Repair Mortar. This product is actually stronger than concrete, making it perfect to repair floors that endure a lot of heavy traffic. Specifically for fixing and repairing bay edges, eroded or damaged concrete and broken steps, this epoxy mortar doesn’t shrink or crack. It can be used inside or outside and means the surface will quickly be back in action. Repairs made with this product are pretty much indestructible. For quick and lighter repairs on concrete floors and walls, try Rust-Oleum Light Duty Epoxy Repair and Sikagard 720 EpoCem, which is a three part epoxy and cement combination micro mortar for surface repairs. Smoothing uneven surfaces and floors calls for a fast acting and durable product, like Rust-Oleum Speed Screed. Ideal for transforming rough concrete floors this is a self-smoothing screed that leaves a slip-resistant surface in a light grey colour. Ideal for industrial areas that are exposed to heavy traffic and chemicals. Rust-Oleum’s Scrape Coat is also self-levelling and can be used to flatten concrete floors to ensure a smooth, safe surface. Solvent-free, scrape coat provides a seamless finish and is simple to use. SikaLevel Latex Ultra is a very quick setting cement-based powder that can be mixed with water and used to level out uneven floors and screeds. It can either be covered with a floor coating or can be left as is for a smooth, even surface. Another powder repair product, Rust-Oleum Pegacrete can also be mixed with water to level and repair cracks in cement renderings, concrete and brickwork. It’s guaranteed not to shrink and can be used inside or outside. Fine cracks in concrete need specific products to fix and repair them. A specifically developed liquid crack filler for concrete, Rust-Oleum Epoxyshield Fine Crack Repair that is guaranteed to be non-shrink ensuring a smooth finish to the concrete surface. This is an economic way to repair a concrete floor and works well for cracks up to 3mm wide.